(DV) Samuel: "The Case Against Israel" and "Munich"
Steven Spielberg’s film Munich is about Israeli agents who cloak-and-dagger around Europe murdering dark, hooked-nosed Palestinians thought to have conducted the 1972 Munich attack on Israeli Olympic athletes. Is Munich a morally complex film which shows us how and why Israel has to use terrorism to stop terrorism? If one’s source of history and international understanding and compassion is, somehow, taken from news media such as CNN and the BBC, then the film offers a deep experience on morality and politics. However, if one looks at Munich through Michael Neumann’s book, The Case Against Israel, the film becomes a transparent work in the tradition of American filmmaker D. W. Griffith. Spielberg is trying to feed us a view of Arabs and the Islamic world that stokes Western governments into legislating repressive laws. This is happening not only in the home of the Magna Carta but also on this side of the Atlantic. For example, the PATRIOT Acts enable agents of the FBI to inspect lists of books that borrowers, with names like Ibn Rasheed, Si Azeedin or Andrew Said, may have taken out. The key Mossad Jihadist is played by an actor who Spielberg dramaturgically develops fully by showing him to have an evolving relationship with his wife who gives birth to a child; we are introduced to his mother, and he remains, until the end, a loveable Jewish assassin in blue jeans with a crotch bulge equal to Benito Deltorres’. Golda Meir is made to look like an angel of mercy shedding a Sufi effulgence on her secret agents while offering them tea with milk and honey. She is a bed of roses, not chief director of land expropriations. The Palestinians are never developed to the same extent. We get the impression that their resistance is irrational and unfounded; they’ve never faced the same psychic misery that Israeli Jews have. How might a boy-soldier from Brooklyn treat a pregnant Palestinian woman at a checkpoint? The Arabs are only given enough screen time to say a few black and white lines. Moreover, to trick the naive into seeing Israeli Jews as morally superior, Spielberg has inserted a cardboard Palestinian poet who is a supposed terrorist. He is killed before he can explain why it might have been necessary for him to use terror. Are we to think that terrorism resides in the Arab genetic code and not in the fact that they were subjected to the venture of Zionism? Palestinians were large enough to have caused the events of Munch in 1972, but not important enough to be integrated in his film. The very fact that Speilberg allows a few gutturally voiced lines to fall from their mouths shows that he knows about their ordeal but, mysteriously, does not consider it worthy of screen time. How one-sided can an American filmmaker get? Spielberg is fluent in using historical documents to make films such as Amistad, a shallow yet multifaceted film about the slave trade. Africans emerge as people with past and present lives. For Arabs, Spielberg’s Munich resembles the American filmmaker D. W Griffith, who in 1915 made a racist classic The Birth of a Nation. For Spielberg, the Palestinians have become what blacks were for Griffith: Dark, threatening creatures to be eliminated with extreme prejudice. What was the average age of the Palestinians who conducted the Munich attack? What happened 24 years before Munich 1972? What happened on April 9, 1948 at Deir Yassin? And on October 29, 1956 at Kafar Qasem? Anything? Something? Nothing? Spielberg knows about Deir Yassin and Kafar Qasem. Does Zionism take us to the murders at Munich 1972? The issues that Spielberg hides are the ones that Neumann lights in a scholastically stark and unique manner. Thankfully, his views don’t resemble the rampant anti-Americanism that one sees everywhere; nor is he anti-Jewish as his detractors will undoubtedly inform us; nor is his historical analysis anti-Israeli. Spielberg wants a one-sided victory in which Israeli Jews rest morally high above the Arabs. What is preventing Spielberg from traveling on the same carpet as Neumann? Which influential Americans know the same history as Neumann? In light of the full-blown apartheid in Palestine would these Americans initiate a full boycott against Israel? Would Noam Chomsky? (Neumann calls Chomsky a Zionist on page 23). Would Woody Allen? Neumann has tried to start a boycott, but didn’t get support. Munich is a cinematic Nuremberg in which Spielberg, along with his producers, actors and all his crew tell us a hideous fib about Israel. In God-fearing America such fibs can only be checked, not corrected. Neumann’s The Case Against Israel renders Spielberg’s Munich irrational hate propaganda. Julian Samuel is a Montreal filmmaker and writer. He can be reached at: juliansamuel@videotron.ca. 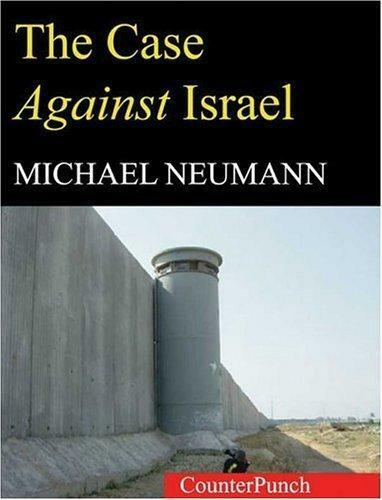 * Michael Neumann has written extensively on the Middle East: See for example "How Time Flies," CounterPunch, September 23, 2004; and Michael Neumann's Israel-Palestine Page.